Part of the golfing experience is being able to enjoy the outdoors, however when the weather is overly hot and humid that experience might not be so enjoyable. Being out on the course and sweating through a hat or dealing with that burning feeling when sweat migrates down into the eyes, can make the round miserable. Not to mention, having to deal with all those stains that infiltrate the fibers of said hat, leads to either washing or throwing away a favorite cap. 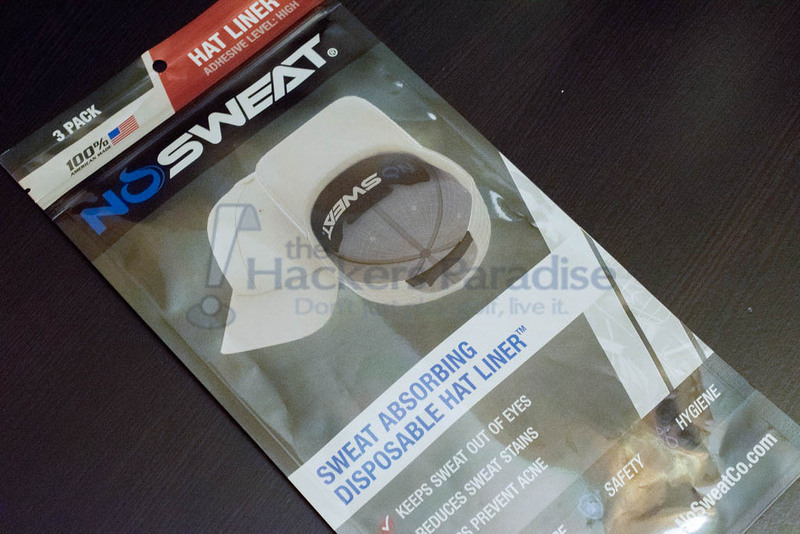 Instead of being reactive, NoSweat offers a hat liner that is proactive, to keep the effect of forehead sweat from reaching these negative outcomes. 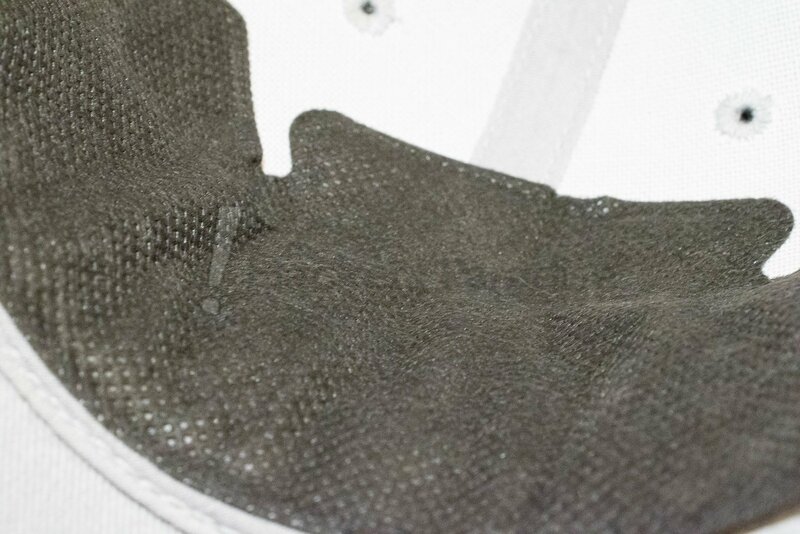 As can be seen in the video, adding this liner to the inside of the hat takes just a matter of seconds. Just unpeel the paper backing from the adhesive side, line it up along the front of the hat, and press the liner firmly to make sure it sticks. Having worn these for several rounds, the only time a liner did not stay put, was two days after its initial use, and to be honest, wearing the same liner on multiple outings is probably not the best idea anyhow, although it can be done. During an abnormal fall heat wave that swept through the northeast, these got plenty of use on the course. Heading into the round, the biggest concern about this product was just how well it would hold the sweat without providing that soggy feeling. Anyone who has used a bandana to keep the sweat from their eyes knows how it’s not the best solution due to how it retains moisture. However, the NoSweat liner was just the opposite. Not only did it do a great job of keeping sweat from ruining my hat and running down my face, but it did all of this while remaining fairly dry. In fact, there were plenty of flashbacks to summer rounds in Myrtle Beach where this product would have been absolutely perfect. As someone who is fairly picky about how hats fit and feel, there was some initial intrigue about how differently a hat would wear with this liner in place. Thankfully, these are not very thick, and after wearing one for about 15 seconds, it was pretty easy to forget a liner was even present. Even on less structured hats, there was no extra bulge on the outside that would give someone the impression that there is a concealed secret weapon against sweat hiding underneath. After spending some time on the company’s website, you will find many other activities that these lines can be used for. Any sport that uses a helmet, such as football, hockey, or lacrosse, would be good prospects for such a product. They even make liners that will work for the inside of a hardhat, for those on the construction site who have to deal with adverse conditions more frequently than golfers. These scenarios allow for a well-rounded product that should garner much more appeal than just being limited to the golf course. In fact, the use in the helmets or hardhats help emphasize the other benefits to these liners, and that is keeping one’s forehead from breaking out with acne cause by sweat. So, while it doesn’t have to prevent stains on a helmet, it can help keep someone’s skin in good shape. NoSweat hat liners can be purchased in packs of three, twelve, or twenty-five, with prices starting as low as $4.99 and topping out at $29.99. More information on NoSweat hat liners can be found at www.nosweatco.com. This is something I’d try, more to save the hat than to prevent sweat from running into my eyes. My concern would be the added heat from placing this in the hat. Great demo video and something I can definitely use in TX. 25 for $30 is a fantastic bargain and something I was curious about. Can definitely see myself ordering some of these very soon. nteresting product. I would definitely give it a try with the really hot and humid south GA climate 8 or so months a year.? Great review!! What a clever idea! I will certainly be trying those next summer!! That’s a great product idea. I’ve done through a lot of hats because our away stains, it’s good to know this product is out there. Great video Dean. After seeing these when you first got them it is really a cool product that works and is priced right. Great review and Great Product! Thanks for bringing this to THP. Going to have to give these a try. I’d love to try these. Hats are not cheap, so anything to save them and keep them like new would be great. As someone who sweats easily and a profusely these have my interest. I have tried a similar product, but they didn’t stay attached very well. For a golfer in SE Texas the humidity can be a pain. Sweating through hats is a common occurrence and if I forget to apply sweat stain to my hats, they are usually done after a few uses. This is something that might help the shelf life of my hats last longer. I bought 12 of these about half way through the summer. The first time I installed one into a hat it was a bit of a struggle. After the first one it became much easier. Being bald, it doesn’t take long to have sweat ruin a good hat. There is no hair to trap it before it goes into the hat. These hat liners really work well. I have had no stains on the hats that I installed the liner in. I also have worn the hat(s) multiple times with no adverse effects. They stayed where they were installed and did the job they were supposed to do. A good product! I don’t see much use for this product. If it’s hot, I soak my hat in plain water before playing. A wet hat keeps me cooler, and reduces the sweat stains. As the hat dries, I re-wet it at the water fountain. Overall, very little if any stains on my hats. Product has been doing wonders for my golf hats! Bought a hat from The Players Championship, wore it all summer in the heat. Was surprised to see not a single sweat stain on the front where I tend to get the worst salt stains.